Expansion or Extension: Management ‘specialists’ talk about Stretch Goals, or even Big, Hairy, Audacious Goals, or BHAGs. Venture capitalists, with whom you you are probably not concerned, want to know the the new venture has ambitious plans for ‘scaling’. Listen skeptically, for while stretching is good, overdoing it leads to being overstretched. So, once the startup has reached a sustainable velocity and gained traction, the goal should be to extend more than expand. Extending will involve going wider and deeper—adding more value and strengthening the business. The scary chart (right) from the Bureau of Labor Statistics Entrepreneurship and the US Economy (November 2014), shows just how fast startups fail. Half of them closed before five years are out. Of course, the reasons for failure are many, but over expansion—or premature scaling—is near the top of the list. The choice between expansion or extension should not be a choice for entrepreneurs. Most lists of the reasons for failure cite over expansion near the top. Over expansion is so dangerous because it quickly leads to negative cash flows (about a third of all failures). And—82% of startups fail in consequence of a poor understanding of cash flow. This is not so obvious when you are all bright-eyed and bushy-tailed at the start of a new venture. Of course, the entrepreneur may have started the business for the wrong reasons, lacked planning or capital, and liked growing too fast, these are all examples of poor management. checking that all business actions support the purpose of the business. 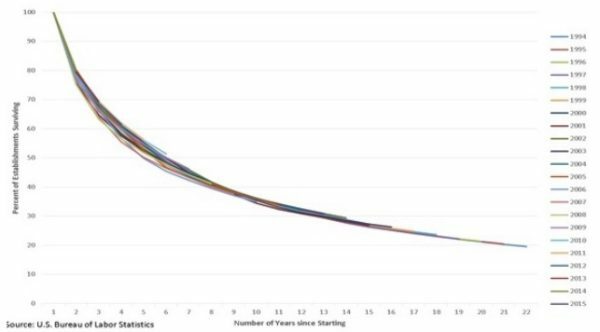 Your chances of making the curve flatter in the case of your own startup are considerably increased if you extend better than you expand. You will strengthen your people and you will strengthen your relationships with customers. Many entrepreneurs are tempted to jack up revenues by leaps and bounds, because it is a challenge. It’s the best way I know to run out of cash and hit the wall—with a splat. If there is a choice between expansion or extension, choose extension without hesitation. The reason why cash management is so important in the early stages of a business is to avoid that very thing and prevent overheating. Market share and sales growth may be irrelevant to survival. In the same way, employees need nurturing so that they can strengthen their ability to deliver on the value proposition. Beating them over the head to get the product out of the door, or cutting costs to the bone, may appear to be sound business, but both have a tendency to destroy, rather than create value. Founders Stay Afloat: by tracking 25 vital facts and figures*. Watch the critical numbers like a hawk. Be a first-class ‘noticer’ of everything that changes-or stays the same. Keep an open dialog with customers, developing relationships, so users are ‘hooked’. Add features to products or services-and support, don’t cut them back. Check that all components of the business models are continually coherent. Build skills of everyone in the business-and that includes the founders. Learn from mistakes—often. Cherish the beginner’s mind. Mitigate risk and keep checking the downside; it trumps exponential growth . Be prepared to pivot; too much sticking to the knitting may stifle you. * this is the title of an eBook I wrote; if you’d like a copy, you can get one here: Founders Stay Afloat. It will really help you make good choices, especially between expansion or extension.